Recently introduced to the work of photographer John Pfahl. He visited this sand pile way before me - sand pile child. 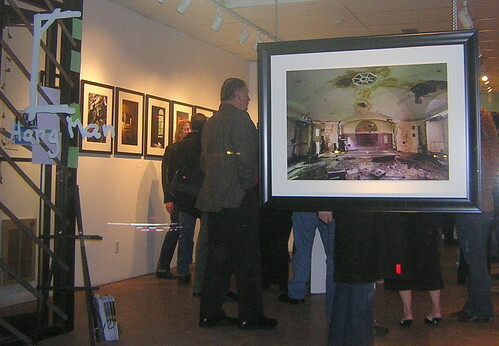 His gallery contains images gathered here in Buffalo and elsewhere. If you still haven't switched to firefox as your browser you really should. Another reason, new and enhanced version of mozilla's FireFox 2 just appeared on the scene. Get it right here. Switch today. Web works better with it. This multi-tasker loves the tabs and customization. Means more efficient desk top and workspace. Met up with Gabe from BuffaloRising this afternoon...he was going on about the brick oven pizza at Delta Sonic across from Artspace, wouldn't stop...been doing this on a weekly basis since January...check it out...at the corner of Barker and Main. Buffalo's only brick oven pizza, right here in Midtown! One of my former students e-mailed the news about Duke Realty late this afternoon. Check it out - DRE hit a 52 week high at Monday's close. They're the one's behind City Hall. Bizz must be good. Talking with Sean and friends recently I was introduced to the work of Camilo José Vergara, photographer and author of How the Other Half Worships (2005) among numerous other titles that I mentioned last week. Interested? Make sure to check out Vergara's site - Invincible Cities. Here, you learn about his efforts to document the American ghetto in the same way the FSA photographers captured various aspects of the cultural landscape 70 years ago. Those images - right here - from the Library of Congress and the American Memory Collection provide an important link to Vergara's short essay which is a rich introduction into his thinking and work. Vergara presented some of his Invincible Cities findings during ReConceptualizing the Built Environment, a conference at Harvard University last year. His Images as a Tool of Discovery contains an abstract and full length text of his contribution to that conference. And learned that the name Invincible Cities, it's borrowed from the poet Walt Whitman. I've been thinking of a post about the numerous houses of worship here in my neighborhood for some time. I'll be spending a few hours with How the Other Half Worships, during my day off. So expect a post soon depicting the various places of worship here in my 25 block neighborhood Main/Jefferson - Utica/Ferry. Here's another view, guys swinging big beam into place. I've been keeping an eye on St. Vincent's around the corner at Ellicott and Riley and spotted construction activity this afternoon. Seems like Cash Cunningham's crew is doing the sort of extensive emergency remediation necessary to prevent further decay. The soffitt has been removed and looks like some mortar work was being completed today in partial preparation for the new rubber roof. Earlier this month I posted - St. Vincent's Rescue - with all sorts of links to earlier posts and history. 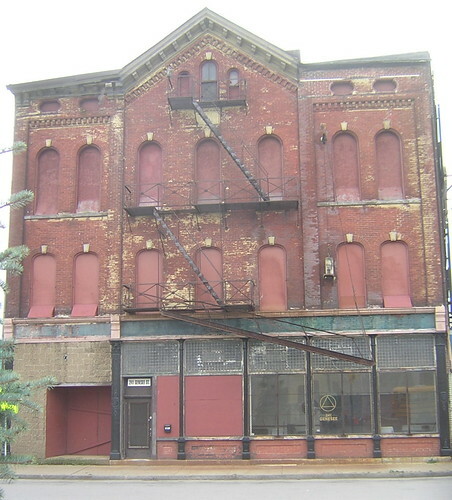 I praised Cash for setting a new high water mark in Buffalo, NY for taking care of heritage buildings. This is excellent news for the neighborhood. Wish I could say the same for this place...orphaned, down on Dodge Street. Perhaps one of the egregious examples of - and right here along vinyl alley, Michigan Avenue - vinyl madness is this home at 83 Glenwood Avenue [google map]. Just love the architecturally significant second floor window. Here's the past 11 years sales data, from the City's website for this house. 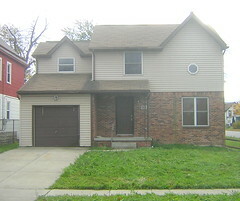 Two cycles of foreclosure at this location. Seems like in both cases owners paid about two years, then skipped. First was $81K in 2001 and the second time someone got stung for $97K, in 2005. I've watched the bank's property management company show up with dumpsters twice to clean the place out. 83 is smack in the middle of my view when I look down Michigan Avenue from my office window. Usually once a week on a boring night here in Florida I peruse the latest real estate listings in Buffalo. As you know, there is never a shortage of "Vinyl Victorians" back on the market after just a few years, with an asking price substanially below the subsidized cost to build them. Why politicians and average citizens think any new built home; regardless of cost, design, quality, durability and practicality is good thing I will never understand. I guess that is what I get for utilizing rational thinking. I could go on forever, but I know I am preaching to the choir. Anyway, I found this one on Glenwood Avenue that could vie for the spokesman for the failure of vinyl victorians. This is the worst one yet. Makes you want to bang your head on the wall or hit the bottle. Vinyl victorians are growing like weeds. I'll be ramping up my coverage of issues related to this scourage, in the coming weeks and months. I first posted about 204 High Street back in September, right here. It's a cool property that's City-owned and was last a medical office. The proximity - one block away - from the medical corridor would make it an ideal location for another medical office. 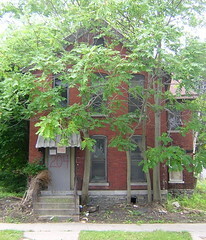 The property is set up in "L" fashion wrapping a vacant lot with a big chestnut tree at the corner of High and Maple. The demolition has been stayed. We have a few more months to find an owner for this very unique property. 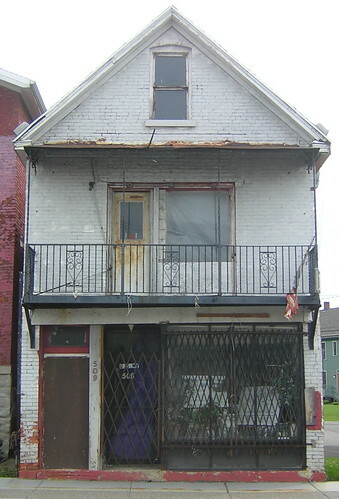 Considering a plan for this property at 204 High Street? Let me know. I'll do my best to walk you through the steps in purchasing it from the City. If you're interested in a tour, let me know. Been into things google, long time, here recently. One of the coolest mash-ups using google maps is still ChicagoCrimes.org - I've been linking with the button on the right for the past year. Really cool way of keeping track of what's happening where, in Chicago. Very easy to navigate and you can search by street, block and get rss feeds for any combination of data. Really cool. Question for Buffalonians. How transparent is crime data here in Buffalo? I know you can request certain data sets, yet I think it would be beneficial on many different levels to have similar data available here on-line for stuff that goes down in Buffalo. Fire department activity, too. Wonder about all the sirens and I know that the Buffalo News doesn't cover most of the Fire Dept's activity. If this or similar data is available for Buffalo, NY in a manner that is easliy retrievable, I'd like to know. 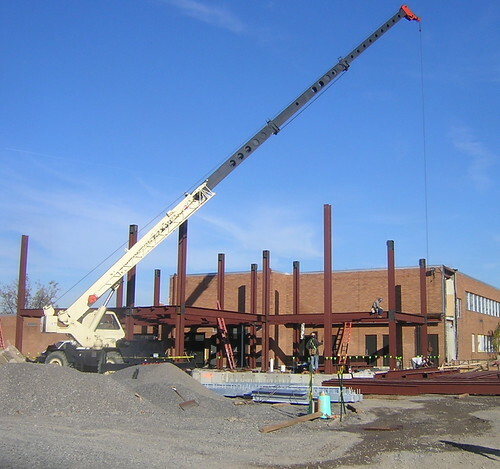 The pic shows considerable progress on the first of three new additions to the new home of Performing Arts High School. This is the new main entrance addition along Ferry Street as depicted in the banner sketch above. This past week I've taken the first steps with Buffalo Bisons management and the BAVPA PTO to coordinate the installation of a commerative home plate for the new school. It was here, on this construction site that Offerman Stadium once stood. Idea is to have a commemorative plaque in the shape of a home plate installed shortly after the school re-opens in the Fall of 2007. Teachers and students part of this effort, too. Last game played at Offerman was on September 17, 1960. Cool to coordinate around this date! First spotted development activity at the nw corner of Michigan and Genesee, last October - right here - and returned today, one year later. Simple coincidence. All sorts of issues, I know. This evening at the UB School of Architecture and Planning lecture with William Bruder, I learned a few things about the intersection between design and development. He began and ended with the perplexing notion that we are all really perpetual students and peppered the fast paced slide show with wonderful aphorisms that included - Clients may have a love for stone, but a budget for block - nothing is perfect, everything is a challenge. Really got into his head and appreciated the fact that architecture is his second gig, sculpture his first. Really wonderful discussion on green design and how to deploy it by expecting students to design for it now, while still in school. His design of the new Phoenix Library uses significantly less energy than previously expected. Appreciated his understanding of place, too. At the Phoenix Library there's a sky light and column set up in the largest reading room in North America, it lines up with the sun during the summer solstice. Lot to expect, yet as we learn from projects like this above - nothing is perfect, everything is a challenge. This building at 241 Genesee is located just east of the Michigan Avenue [google map] intersection and between the NAPA Auto Parts store and Pinnacle Charter School that I first wrote about last December. This afternoon on my way to Mazurek's I passed by and decided to take a closer look. 241 has been vacant atleast since the mid 80's when I returned to Buffalo. Very cool looking building. The transom windows are something special and full of 4" square prismatic pieces that were designed by Frank Lloyd Wright. FLW patent. These prismatic squares can be found in many places all over the City. I've been collecting them for awhile. Here's a close-up of one just around the corner at Maureen's, right here. And another from a recent eBay auction with some FLW information. Cool. According to City records 241 has bumped around in foreclosure proceedings in the 10 years and has 12' ceilings with approx 11ksf of floorspace. As cool as this building at 900 Genesee and 630 High at Genesee. Longer post about some of the additional amazingly beautiful buildings on this portion of Genesee between Michigan and Jefferson, soon. 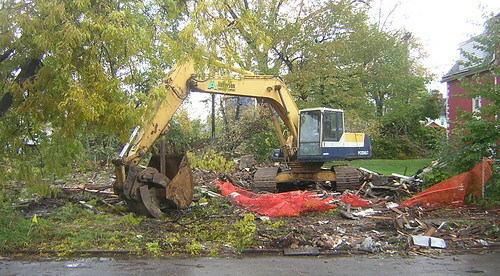 Building demolished. New parking lot on Michigan Avenue just north of Carlton and across the street from Roswell Park. fixBuffalo reader tipped me off to all sorts of cool cabinets that were outside here, last week. Didn't know the building was coming down. No photos. Sorry. Very nice piece that captures the true spirit and high ethic of urbex. Just heard from Sean and the DK group about the schedule at The Hangman Gallery. Schedule is changing up a bit. Best call the gallery 416.465.0302 if you are planning on heading up for the show this weekend. The guys check in here, so I'm sure scheduling will show up in comments, too. 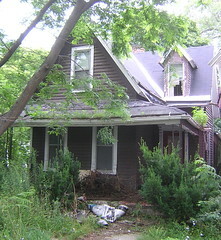 Learned late Wednesday that a demolition order has been signed for 28 Coe Place. First wrote about this in August - right here. 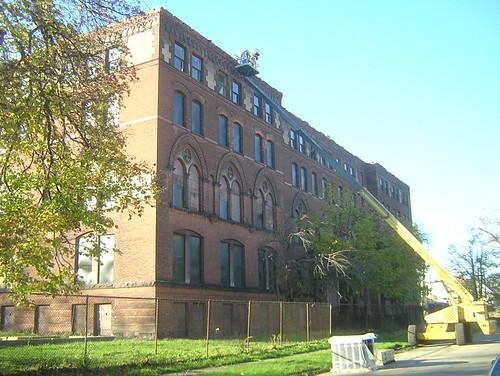 This property is currently trapped in MBBA hell - that Aaron Bartley and the folks at PUSH Buffalo have been calling attention to and working to change. The right thing to do in this particular case is to release 28 Coe Place from MBBA's callous grip and turn it over immediately to a qualified individual for re-hab and home ownership. This house has some serious deferred maintenance issues, yet I believe after a reasonable investment and commitment by a new owner, especially as Coe Place is adjacent to Artspace, the project will result in tremendous positives for the right individual and the neighborhood. I'll be gathering the "Friends of Coe Place" together once more - we changed the future of the Hamilton Ward House right across the street at 19 Coe Place a few months ago. I'm confident that a carefully focused and cyber campaign will turn the tide here at 28 Coe Place, too. One of my favorite buildings on Michigan Avenue is this little one at 509 Michigan [google map]. 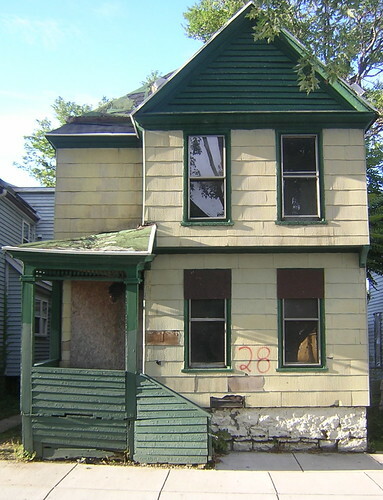 When I took a closer look last week, the house appeared vacant and according to City records was purchased for the tidy sum of $350K last April by the Buffalo Urban Renewel Agency, BURA - the current owner. 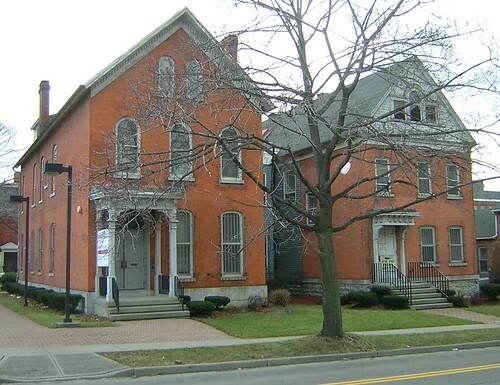 509 Michigan is located next to Buffalo's newest historic district, that I first mentioned in January. 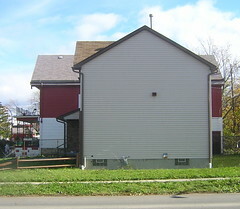 The first picture in that post shows the back side of 509 Michigan. Various developments along Michigan Avenue October 2005 and December 2005. Lots of changes along Michigan recently. Updated construction pics of the medical buildings first mentioned last December, again soon. Meanwhile, if anyone knows what's happening here with 509 Michigan Avenue, let me know. Reminds me of pix I've seen of places in New Orleans. Not many cool little spots left as the vinyl invasion and the suburbanization along Michigan Avenue is in full swing. And a post about this part of Michigan Avenue wouldn't be complete without a shameless plug for my real estate attorney, Loran Bommer - an awesome jazz pianist - who recently purchased the building next door, the former police precinct building [pic] at 485 Michigan Avenue and re-located his law office here from downtown. He can be reached at 842-1222. Great attorney, awesome guy! 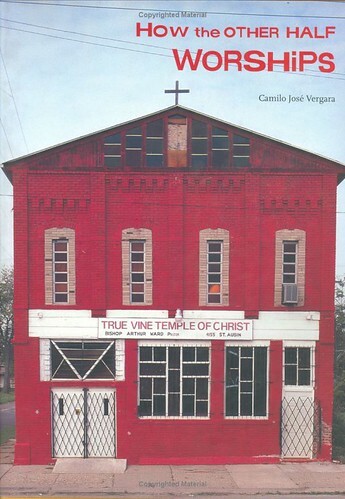 Located another book by Camilo José Vergara, that I first mentioned on Monday right here so posting will be light 'till Thursday. Lecture Wednesday evening at UB - 301 Crosby Hall - William Bruder. Begins at 530pm. Free and sponsored by School of Architecture and Planning. Details. Plan to attend. Mentioned Bashar Issa's project last week - right here - guess Wednesday morning is it! 10am at the Statler. Great mantra at the BSC - Group cherish the past - adorn the present - construct the future. Great link to high places in Buffalo - skyline details. Very good news for Buffalo. Notice that numbers of Firefox users are increasing which is a good thing. Viewing fixBuffalo in Microsoft's IE - even the new 7 - is a painful experience. If you are stuck on a network, put portable firefox on your flashdrive - I do it for school. Works great and the entire blogosphere looks and feels better. Really. Recently - thank you Sean - introduced to the work of Camilo José Vergara (1944 - ) a Chilean born photographer of American Cities and ghettos. Just spent the past few hours reading The New American Ghetto (1995). Here, Vergara weaves together various dystopian themes commonly associated with movies such as Metropolis (1927), Blade Runner (1981) and Brazil (1985) - which I've yet to see. What seems to set Vergara apart are three decades of photographs documenting the vanishing places in our cities. Motivated by his own loss and personal story, he focuses on Newark, Detroit and Gary, Indiana in The New American Ghetto and presents both poetry and polemic which seems to be a meditation on memory. Really like him. He gets stuff and fully articulates what I see when I walk around my neighborhood and other parts of the City's East Side. Saw a convoy of tree trucks on Ferry Street late this morning and followed them to the former BMHA complex on Glenny Drive off Fillmore [quikmap map]. Was wondering yesterday where all the debris was being carted and stored. Walked around the back of the complex towards ECMC and noticed piles, seriously monstrous piles, of branches and limbs scattered all over the grounds here at this abandoned BMHA complex. Appeared as though this was just a transit point for our lumber storm's debris as truck after truck was either hauling wood chips or tree limbs away. 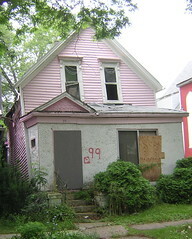 I've been to Glenny Drive before - right here, a few weeks ago and in May 2005 - Revitalize This? Noticed a sticker attached to every truck coming and going from the site. Guess this part of the project belongs to Phillips and Jordan, Inc. Here's a link to the disaster recovery service side of their business. Sometime in the Spring, I'll return to see what's left behind. Meanwhile, get your free mulch! George Grasser just sent out the October 2006 Partners for a Livable WNY e-mail update. Included is a candidate's report card on urban and planning issues, right here. Nice pic here of Rick on top of one. Best map of Buffalo's Grain Elevators. This is all part of Buffalo that I've only begun to explore here and especially here. PresCo tour - "Water & Grain" or "Brews and Pews" moving from planning stages for next summer. I'll continue to archive previous month's updates in the Partner's Archive. I'm a huge fan of flickr - great way to meet-up and share all sorts of pix and information with other people here and 'round the world. Searching for photos in flickr is cool, too. For example all the photos I've tagged with - artspace - come up in a simple search. Very interesting results if you search everyone's photos for the same - artspace - tag. Here are a few of my recent pix that i've tagged as a favorite. Here's the rest. You certainly won't want to miss the Buffalo Flickr Pool for the lastest from Buffalo's finest digiterati. Just noticed this new flickr tool. Lots of additional great flickr applications, right here. Despite a few days storm delay, construction workers were in full swing this past week. Appears as though most of the interior demolition is almost done. Dozens of dumpsters filled. Occasionally lights are left on at night and peering into the empty classrooms all you see are empty shells. At the new Ferry Street main entrance the exterior brick work has started. And while looking at the foundation work in the above pic for the new arts addition, seems like the crew here is pretty much in sync with the work around the corner at Artspace, especially comparing the foundation work for the new units in the rear at Artspace. From the beginning, back in February of '05 when both projects were becoming a reality, I've thought of Performing Arts and Artspace in the same breath, sister projects...feeding on one another as the City's near East side comes back to life. While checking out the latest in Midtown over at Artspace I noticed the sidewalks have been removed and the guys are working on the vault area underneath. Learned that the top of the subway tunnel is just below the bottom of the vault which seems to be about 6-8' down. These days the area behind 1219 Main Street - Artspace - resembles the area across the street from my place at the Performing Arts High School site. See this update. Keep thinking that the synergies between these two sister projects will have an impact beyond our immediate grasp right now. Three cool places on Michigan Avenue - here and here - that act as connecting buildings between these two major projects. Ideal for live/work and studio space. Interested, let me know. I'll get you in touch with owners. I've set up a showing here, this week, perhaps the best candidate on Michigan for this sort of project. Checked out this new build on Sweet Street, Saturday morning. As you can see it sits on the edge of the urban prairie. Hear that the price tag associated with the construction of this house is 160K...first new build on Sweet Street in the last 100 years. That's the steeple from Transfiguration Church on Sycamore in the backyard. The first pic here is looking North on Sweet from the corner of Stanislaus Street and the bottom one is looking South towards the Central Terminal. Here's the map of the surrounding urban prairie. Mosque on the right and the Central Terminal in the middle down below. Had an opportunity to stop by 26 Lombard Street this morning, just as Michael Gainer and the crew from BuffaloReUse were getting underway with their first demonstration project. 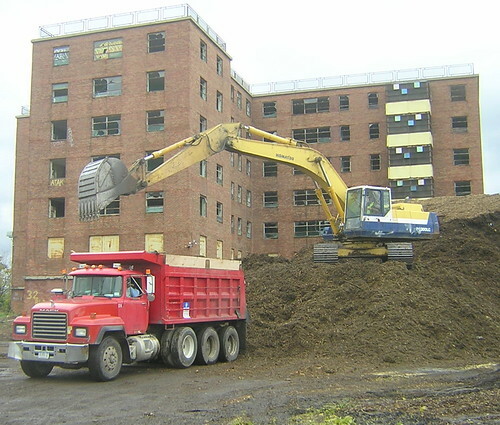 On Sunday, October 22nd, from 9 a.m. - 2 p.m., David Bennink from ReUse Consulting will be facilitating a deconstruction training at the site of our first deconstruction, 26 Lombard Street. 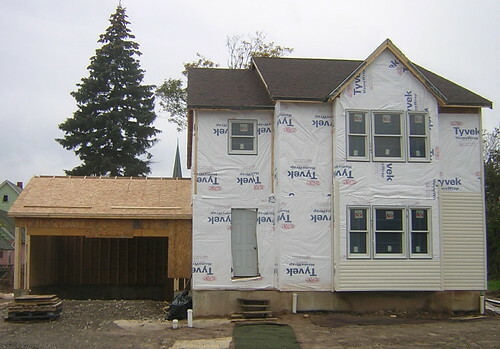 This training is specifically for folks eager to take to the task of actually deconstructing buildings here in Buffalo. Makes tons of sense on a very intuitive level. We'll be waiting to see if Michael and the crew can turn this project into cash. I know a number of people watching this project as an alternative to the current method of hauling houses off to a landfill. First posted about this initiative back in September, right here. First mentioned last Monday on fixBuffalo, the Buffalo News announced today the surprising suspension of Tom Marchese, secretary to the City's Preservation Board. Seems like there was a difference of opinion as to whether the one million dollar demolition of this City owned building on Niagara Street was necessary. 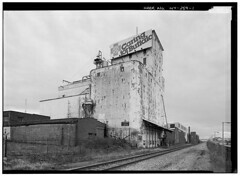 Just happens to be the third grain elevator demolished in less than a year on Byron's watch. 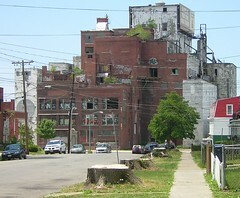 The other two grain elevators - HO-Oats (photo from Sara) and the abandoned City owned and last remaining wooden grain elevator, the Wollenberg. The Preservation Coalition of Erie County has additional details - right here. Sure would like to know what policies are in place and who decides when to pull the trigger on what, when and why. 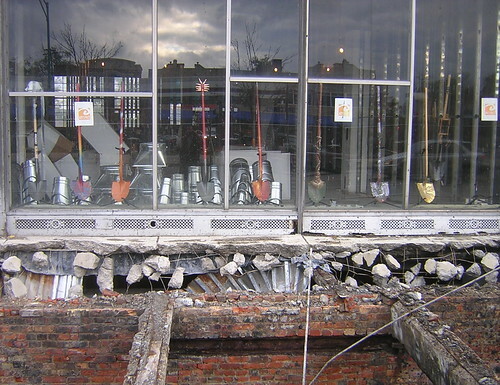 Perhaps a comprensive audit of other demolitions is in order. Will it happen? Is it covered(up) in Citi-Stat? Anyone know? Two more bit the dust here in my 'hood near the future home of Performing Arts High School. Both 99 and 109 Purdy were demoed at some point this past week. I'd dubbed the house on the right the leaning house of Purdy. It's been ready to collapse since I started tracking the house, two years ago. If you are familiar with demolitions in the City of Buffalo pause for a moment and ask yourself if you've ever seen a wrecker like the one depicted here blocking a City sidewalk. I haven't not even here in the 'hood where a different set of rules apply - see Tale of Two Cities. No fencing, not surprised. Here's what the site looked like Friday afternoon. Imagine for a moment the same safety conditions existing in the Elmwood Village, South Buffalo or around Hertal. I know, like never! This weekend will be a busy one for Buffalo ReUse! 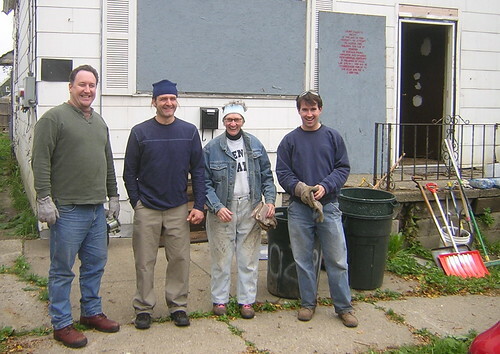 We hope that you will consider joining us for our volunteer day on Saturday, October 21st, from 12 - 4 p.m., to assist with a house clean-out at the site of our first deconstruction. 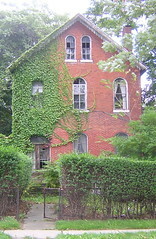 We will be making preparations to a home on Lombard Street and we're eager to get started. No experience required. I've been a fan of this sort of project and good to see they are up and running with a demonstration model. First posted about this aways back - Deconstructing Buffalo. Toronto late Thursday and back to check out the latest from DK PhotoGroup...Orphaned opened Thursday evening at The Hangman Gallery on Queen Street East. By the time I left this evening more than one hundred people had an opportunity to see images of what's got under my skin, these past few years and just a few blocks away. Tonite several large prints evoked a deep sense of loss and things simply forgotten. Matt's black and white of a school chair especially, just pushed aside, surrounded by empty blackness hit me hard. Steve's shot of a statue shatterd - now in pieces, really - on the chapel floor, hands broken and beheaded, reminded me of what I've read of the carnage left behind in early modern europe. Senseless, random...how we care, and don't. Each photographer had their own portfolio available providing additional context and scene setting shots so people who are unfamiliar with our abandoned orphan home can see the buildings in their larger context. And once inside the complex - the first building you will see is the Chapel, pictured above in the gallery's front window. Guys, very nicely done especially the part where you brought a former resident of the orphan home, back to Dodge Street. Wonderful stories last month about the line out back separating the boy's and girl's sides and all the tunnels connecting various buildings. The Hangman Gallery is about the same size as Buffalo's Gallery 164 on Allen Street and Orphaned runs through November 6th. Get to know the folks from DK PhotoGroup. I'm sure we'll be hearing from them again, soon. The Hangman Gallery [google map].